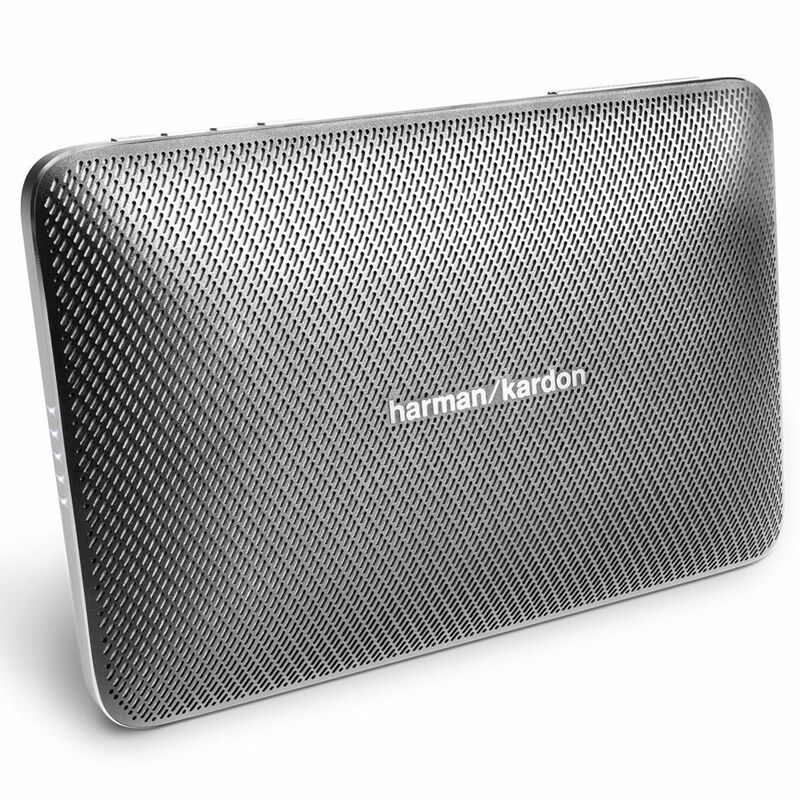 Stream high-quality audio with the Esquire 2 Bluetooth Speaker in gray from Harman Kardon. This speaker is equipped with four professionally tuned drivers that can deliver up to 16W of audio power. It features Bluetooth 4.1 connectivity for wireless streaming to all your compatible home and mobile devices. In case there aren't any Bluetooth devices available, the Esquire 2 is also equipped with a 3.5mm AUX input for lining in audio from other compatible electronics. You can wirelessly connect up to 2 devices at once to the Esquire 2. In addition to its playback capabilities, the Esquire 2 also features a quad microphone conferencing system with 360° voice pick up for all your conference call needs. An integrated folding stand is built-in for propping your Esquire 2 up. Additionally, Esquire 2's built-in rechargeable battery is designed for up to 8 hours of wireless playback time and can also charge your mobile devices via the built-in USB port, which outputs 5V, 1A of power to compatible electronics. Wirelessly connect up to 2 smartphones or tablets to the speaker and take turns playing your music. Built-in rechargeable li-ion battery supports up to 8 hours of playtime and charges compatible devices via the onboard USB port. Box Dimensions (LxWxH) 9.1 x 7.5 x 2.7"
Esquire 2 Wireless Bluetooth Speaker (Gray) is rated 4.0 out of 5 by 39. Rated 1 out of 5 by Frank1234 from not happy first i had the esquire but after a about six months the cable to charch the esquire became a loos fit. so no contact and no charching. Went to store and after a few weeks i got the equire 2 because mine was beyond repare, the esquire 1 was sold out. now i got a newer model, and behold to my surprice there was no etui for the speaker nor there was a charcher, (cost more as nr 1 but you get less) now iam about six months furter on and the esquire has great difficulties to get charched. even playing the thing connected to a charcher it wil drain the battery and stops working, quite an expensive joke this thing is. Rated 5 out of 5 by dtibbs23 from LOVE IT!!! This speaker is perfect! I love the look of it, it sounds amazing and I use it for conference calls and it is the best speaker- headset I have used for calls. I've been told that I sound very clear using the speaker phone. Rated 5 out of 5 by Motasem from Bluetooth disconnects after around 40 minutes Hello, I'm using this devise for around 2 months, the Bluetooth / microphone disconnects from computer after around 40 minutes and during the call. is this a standard or should i do something to extend the parring time between the device and the computer. Rated 5 out of 5 by tetenmd from Elegant I bought this because of its looks. It looks very elegant, looks excellent on my desk. I was surprised (pleasantly) that the sound quality was crystal clear and the bass was deep even if it had no baffles. Cons: no carrying case No charger, only cable included. Excellent purchase. Rated 5 out of 5 by Sharr from awesome speaker Bought them a week ago after returning many other bluetooth speakers. I should have started here in the 1st place. I would have saved time. They're awesome, crisp, clear quality sound. Rated 5 out of 5 by JackyB from Great Speaker I recently purchased this from my local electronics shop and I am completely astounded that something this size can produce a sound so vast and powerful. Two words. Purely. Amazed. Can I pair it via bluetooth with my Samsung TV? Asked by: Tong Ming T.
This would not work with a TV. I want to charge esq 2 with wall charger. what is min and max power/output needed to charge but not damage battery? time to fully charge, how can you tell? There is a maximum charge Amp limit of 2A according to the manual. 5V and max 2Amp. How do I know that the speaker is charging? It took about 3 months for my battery to die. It currently works for 30-35 mins after being fully charged. Is there any information of how can I change it by myself, because I think there are no any official dealers of Harman/Kardon in Kazakhstan? You mentioned you are in Kazakhstan. Please contact the store where you purchased the Esquire 2 and they should be able to help, or at least guide you to the people who can for your warranty options. Hi, my Esquire 2 is ca. one year old, worked perfectly till about a few weeks ago. Now it disconnects randomly from various devices when used. (Battery is charged). What could be the solution to this problem? thank a lot. We would like to work with you directly to help with your inquiry. Please submit a case request at https://www.harmankardon.com/support-contact.html and the Customer Service Team will be more than happy to assist you. I just purchased my Esquire 2 after wanting it for a long time. I am very happy with it so far, build quality, finish and sound. However how do I tell the speaker to switch between two different successfully connected devices with out repairing them? OK I see. The Esquire 2 can connect to two devices simultaneously and then you just need to start an audio source for either device and the Esquire 2 will automatically switch between them. My main issues is on turning on/off the Esquire 2 and reconnecting it as I am using a PC for Skype and iPhone for calls. It would be great to get firmware to allowing pushing the BT button to switch between connected devices and long hold of the BT button to sync devices. My work around for Windows 10 was to follow this: http://blog.jongallant.com/2012/12/windows-8-bluetooth-connect/. This works but it is not clean/simple/elegant. The firmware update I suggested would take care of this and maybe you could even increase the number of connected devices to 4 and reuse the battery LEDs to indicate which device is currently connected 1-4 etc. Should I charge it before using the speaker with the minimum power it came with? Or can I begin using it right out of the box using up that limited charge it arrived with? Can I connect a phone to two or three esquire2 at the same time? You may not connect one phone to 2 or more ESQUIRE 2's since it does not have a stereo or party mode. You may however pair up to 2 phones or tablets to the speaker and take turns playing music.